This outfit has Fall written all over it. It may be a few weeks too soon, but I can't take it people. I am so ready! I just got this Dahlia jacket from Sugar Love Boutique and I am in love! I actually got it a few days ago, but work has been so hectic I wasn't able to take pictures until last night. So the wait has built up my anticipation even more. I couldn't wait to put this jacket on and pair it with a cute pair of cognac boots. I apologize for the darkness. (Once again work consumed my life and I got home late). Not only is the mustard color gorgeous, but the fit is perfect! I have a slight obsession with blazers, jackets and cardigans. They are an easy upgrade to any outfit. This is by far my favorite in the closet now. When I came out from the bedroom even Jon said, "Whoa, I'm digging that jacket! It will be perfect for Fall". Thanks hubby, I'm so proud of your growing fashion sense. You should probably show your closet some love and buy some pieces from Sugar Love Boutique. I am currently drooling over this sweater and this dress! PS. I'm sure you all know NFL started last night. If you didn't know that we may need to rethink our friendship. Needless to say Jon and I planted ourselves in front of the T.V. with a frozen pizza and an ice cold Bud Light Lime. Pure bliss! (The lifestyle change I spoke of yesterday is starting next week). Football isn't football without a beer. Peace out sugarbabies. Have a fabulous weekend! I was not compensated for this post. All the ravings are my own. 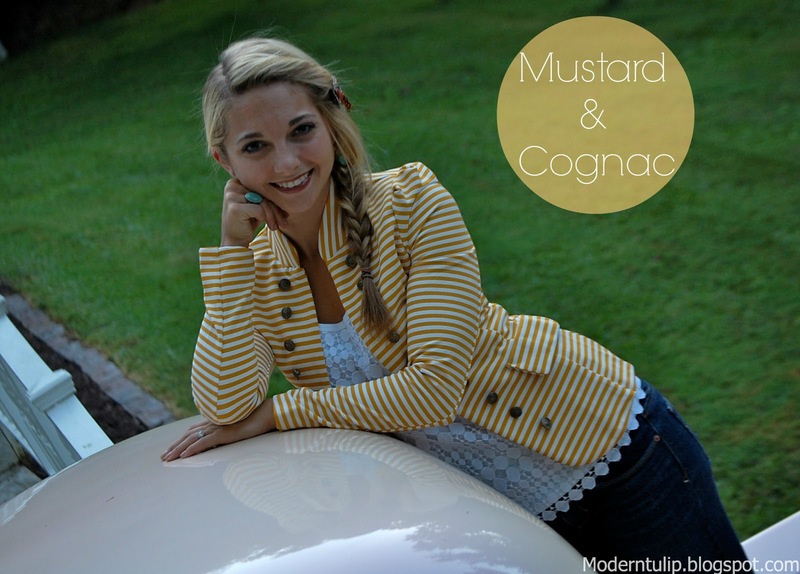 4 comments on "Wore: Mustard & Cognac"
I love this outfit! Looks great on you! Love the white top! And the yellow jacket! And the books! Seriously. I love autumn. Love this outfit!! I love the jacket, the shirt and the boots! haha! I can't wait for fall! Hope you have a great weekend! Absolutely love this outfit!! So ready for Fall!